All good things must come to an end. Until next time southwest US. Until next time! I really enjoyed all of the wonderful things we managed to do and see. I definitely recommend folks who haven't been out that way, to take a trip. The United States is huge and there are so many neat and wonderful things to do throughout the country! Sadly the time on our trip had to come to an end. We dropped our handy rental car back at the return location and got ourselves together before we took the tram to the airport. I'm always impressed by the southwestern airports and how clean and bright they are! Sadly one of the last little stops but it was so late that I couldn't actually go in an explore. I definitely want to get back here again to visit. But thankfully the crane was found and I was able to get a little bit more information from the finder about this site! An email from the finder, Jean. "Found crane 728 at the Palace of the Governors in Santa Fe, NM. This building is the oldest continually occupied public building in America, being established in 1610. Our camera is charging, so will take a photo tomorrow when we place it somewhere. I hope it will be at the Bandelier National Monument, but if it rains, we may go on to Georgia O'Keefe's Ghost Ranch. 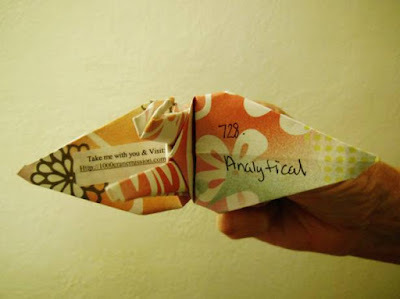 At any rate, will make sure #728 "Analytical" is placed somewhere safe and dry where some other lucky soul can find it and hopefully notify you and pass it on. This crane was found and replaced at the Thousand Oaks Library in Thousand Oaks, CA. So if you've found this crane, let me know! !